Pinto Beans is a food that I grew up eating as a child. I remember having pinto beans at every meal and I remember my Mom pouring a bit of Louisiana Hot Pepper sauce (with the smell of vinegar) over her beans. Those were the good ole days of our childhood and Mom’s country cooking. I’m sure that most everyone knows how to cook pinto beans but just in case, here is how my Mom and me cook our pinto beans. Mix together and store in an airtight container for up to 6 months. Wash the beans and pick out any small rocks that you find, then soak overnight in cold water. 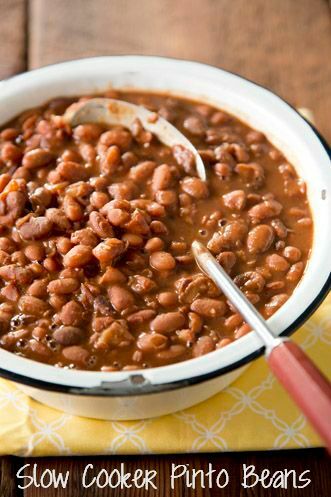 Drain the beans and pour into slow cooker. Stir in chili powder and oregano. If using ham hock: Pre-soak ham in a separate pot, for at least 2 hours, or refrigerated up to 24 hours, depending on how salty you want your stock to be. Add ham hock to slow cooker with beans and pour in ham water that the ham soaked in. Add more water until ham hock is completely covered. Add onion to slow cooker with beans and meat. Stir well. Season, to taste, with House Seasoning, cover the pot, and cook on high until beans are very tender, about 5 hours. Note: If you chose not to use ham hocks, you can use sliced salted pork. Anyone who has children knows that we tend to be in a rush at times and I may use sliced salted pork (1 to 2 slices) instead of ham hocks. I don’t soak sliced salted pork, just throw it in the slow cooker and go, it’s that easy.